Zoe and Sean chose to have an intimate wedding in Zoe’s mother’s backyard in Bayside. It is a place where they have shared lots of love with family and friends, and where their children came to play. 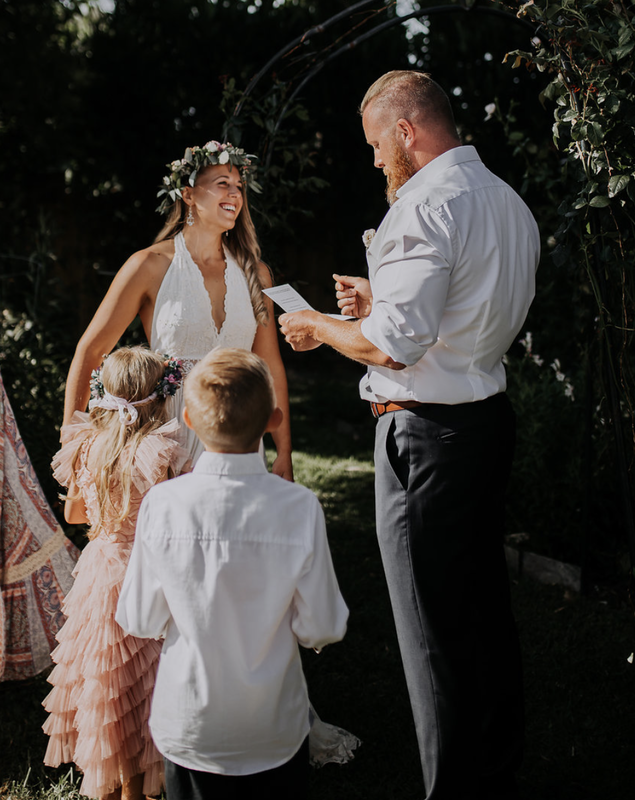 It was the perfect setting for their bohemian style wedding, with aspects of DIY, furniture hire from One Big Day Events and florals from Mordialloc Florist. After a big day of setting up it was time to be on their own and reflect on what a truly magical relationship that they have had so far and to look to the next chapter they were about to begin. They both got ready separately and before the first look was to take place, they sat down to read notes that they had written to one another. This precious moment was captured by the ever so talented Hailey from One Spoon Two Spoon Photography. Before guests arrived, they shared their first look in the rose garden with their children looking on. I am not sure who was more excited by this moment – the few close family and friends that were present or their children! A few minutes after the first look moment, their children ran in there with lots of hugs and kisses. Guests then started to arrive, and they both greeted their guests together. There was such a laid back and relaxed vibe. Guests were enjoying catching up over a drink and soaking in the atmosphere. Then the time had come for the ceremony…. there was no aisle, no processional and no music needed to start this ceremony! Everyone was close by and we all gathered around the archway into the rose garden. As the ceremony proceeded and the emotions ran high, their children came to be by their sides. For Zoe and Sean, their family are their number one priority and it was such a beautiful moment to witness. 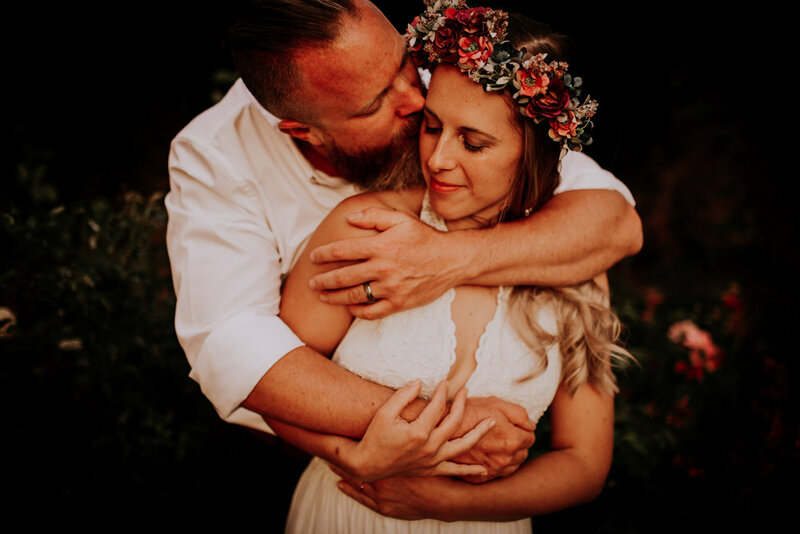 They shared their personal vows to each other, promising to always show each other how much they love each other and that their children will grow up knowing so much love. After a few tears (including my own), it was time to pronounced them Husband and Wife! It was truly a magical ceremony and evening and I am so blessed to have been a part of it. Thank you Zoe and Sean, it is a moment I will never forget!